So what is a nudibranch? The word nudibranch (pronounced noodi-brank) comes from the Latin word ‘nudus’ (meaning naked) and Greek word for ‘brankhia’ (meaning gills or lungs). This name is given because they bare a set of gills which are worn outside of the body. Weird right? Don’t worry it’s going to get even weirder the more you read. 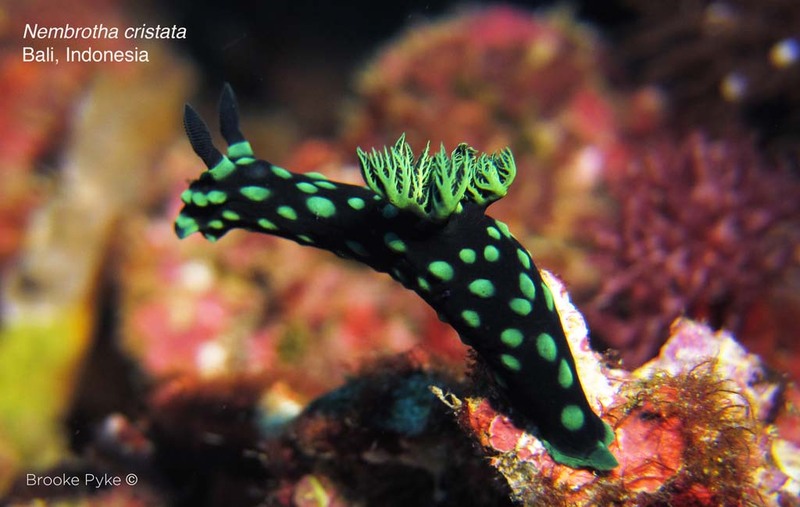 Nudibranchs and seaslugs are ‘Gastropods’ from the family ‘Mollusca’. Many Gastropods have a shell and nudibranchs do as well in their larval stage but in most species this disappears during adulthood. Other species still have their shells internally but it is generally poorly developed. They come in many shapes, colours, patterns and they can range from 1mm up to 60cm in size. Due to their funky appearance and uncanny characteristics they are very popular for underwater photographers and evolutionary studies. Classes : Gastropoda (Subclass Opisthobanchia – This includes: Headshield slugs, Sea Hares, Sidegill Slugs, Sapsucking Slugs. Nudibranchs such as Dorid, Dendronotid, Arminid and Aeolid Nudibranchs. Nudibranchs and seaslugs can be found all over the world and not only in tropical reefs. Tidal pools and coastal regions with temperate and cold waters are also home to these colourful critters. Many species are found way down at 40m and more species are being discovered every year in even deeper waters. Indonesia in the Indo-Pacific ocean is part of what’s called The Coral Triangle. This region hosts the richest and most biodiverse marine fauna of any place in the world. Nudibranchs are no exception to this rule. 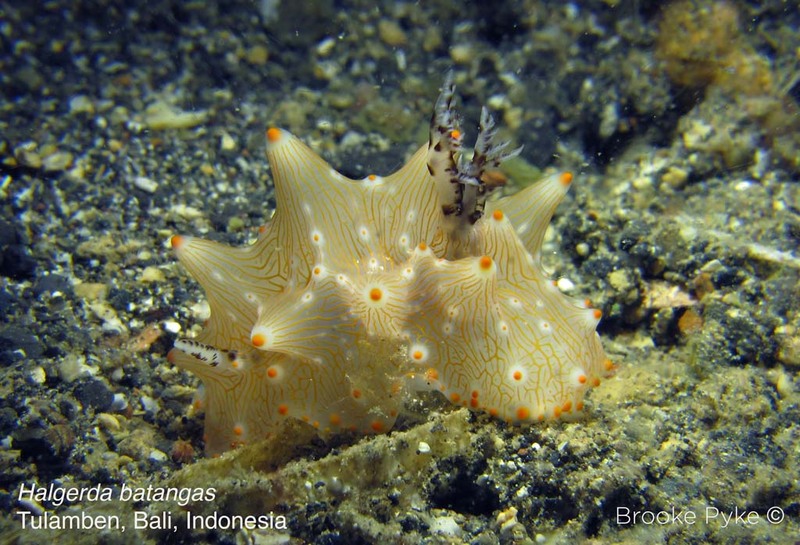 There are are a whopping 3,000 species of Opisthobranchs, (nudibranchs & seaslugs), world wide. 40% of these can be found exclusively in the Indo-Pacific region. When you come to dive with the team at Siren Diving Lembongan, you can meet many of these colourful and fascinating charachters during your dive. Particular dive site such as Crystal Bay, Manta Bay and the north cost of Nusa Penida are very well known for having a huge variety of sea slugs. Opisthobranchs have a typically elongated and thick body. 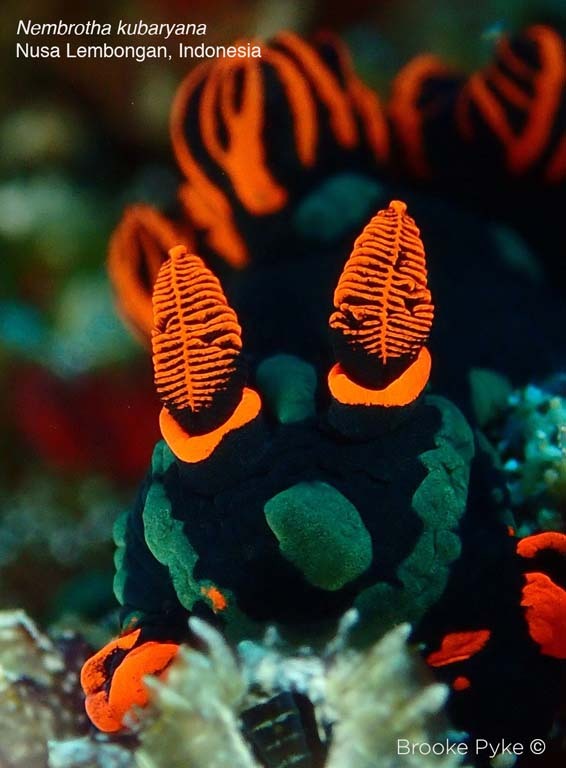 On the head of the nudibranch is a set of sensory tentacles, these are known as rhinophores and function for smell and taste. You will see they have a set of gills (branch) or cerata tentacles on their backs . Some Nudibranchs have the ability to withdraw their rhinophores and gills into their bodies for protection when under threat. The sticky underneath part of the slug is used to move around on, this is called the foot. The sort of skirt around their main body is called the Mantel which is often colourfully decorated. Some nudibranchs have the ability to move their mantle up and down in a kind of ‘can-can’ dance. Check out the video below of a Hypselodoris tyoni doing just that. Some Opisthobranchs such as the famous ‘Spanish Dancer’ (Hexbranchus sanguineus) has the ability to swim buy using a sort of rippling motion with is body. One of the most remarkable adaptions that has evolved in some groups of Nudibranchs is their ability to store chloroplasts in their tissues from algae they have eaten. They then use these cells for photosynthesis (like a solar panel) which provides them with additional nutrition and energy from the sun. Environmentally friendly slugs? As if they couldn’t get any cooler, most are in fact hermaphrodites and have both male and female sexual organs. Because they are slow moving, the likelihood of finding a parter is pretty slim. So to maximise the possibility of reproducing, they have the ability to impregnate and be impregnated at the same time should a fellow adult nudi happen to slime past! After mating they lay their eggs in a colourful sticky mass on the reef. Each species has a unique egg mass shape and colour and will often be laid in a beautiful spiral! Opistobranchs will normally have a specialised diet depending on their species. They may eat things like sponges, hydroids, algae, tunicates and even other Nudibranchs! Some more extreme and daring slugs even specialise in feeding on the ‘Portuguese Man of War’ and other such pelagic organisms! Some species of sea slugs can be quite sneaky and can be almost invisible to the untrained eye. Seaslugs from the ‘Phyllodesmium’ genus are particularly specialised in this and look almost exactly like what they eat! Even after over 1000 dives in Nusa Penida and Lembongan I failed to notice one type of slug called Phyllodesmium briareum which is incredibly well camouflaged. The first time I saw it I was amazed that this piece of what I thought was soft coral simply started to slime its way across the reef. Now I see them almost every day and cannot believe I so easily over looked them for so long. This must mean on every dive we simply swim over so many species of critters without even realising. Some Nudibranchs have evolved to be able to store toxic chemical components in their bodies in order to protect them selves. These chemicals come from what they eat. The ability to do this enabled them to evolve without needing the use of a protective shell. Without growing a shell, much energy can be saved not to mention making it easier to move around. This also lead to the development of their bodies evolving into diverse shapes and colours. Some went down the path of having the ability to camouflage with their environment while others exhibit lush colourful patterns which serve as a warning of their toxicity to potential hunters. So now that you’re a well informed ‘Slugologist’, we look forward to introducing you to our slow slimy friends in Lembongan on your next scuba diving adventure!